The seismic survey data that is gathered via geophysics exploration is extremely valuable and often very large, which is why dGB Earth Sciences sought a solution that would both protect intellectual property and compress the file size during the process of sharing information. dGB Earth Sciences B.V., a privately owned company based in Netherlands, USA and India, has supplied OpendTect, the suite of leading seismic interpretation software solutions, to the Oil and Gas industry since 1995. OpendTect is the world’s only open source seismic interpretation system and is used by thousands of open source users, academics and commercial users worldwide. In 2015, dGB integrated PDF3D SDK into their OpendTect Pro software to give users the ability to convert an OpendTect scene into an interactive 3D PDF file at the click of a button. By converting the data into the PDF format, the scene could then be easily emailed (as the file size would be greatly reduced) or embedded into a PowerPoint presentation, enabling the user to share the image only, whilst keeping the data separate and protected. 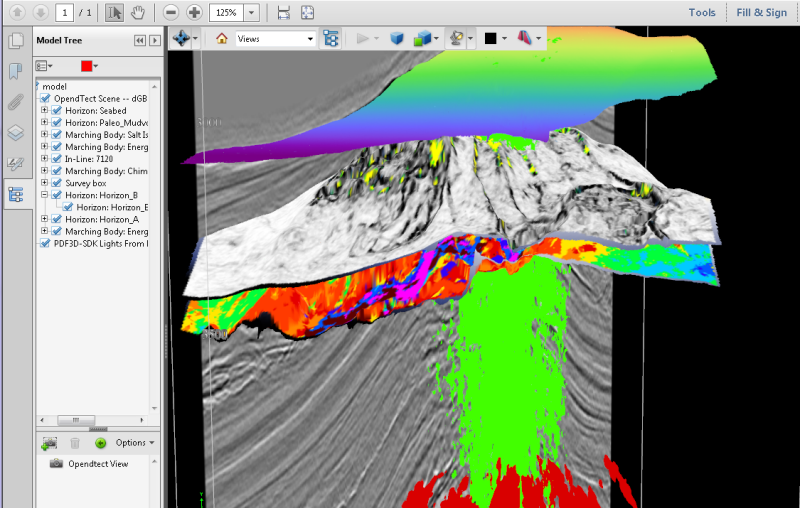 The PDF-3D functionality in OpendTect Pro can grab Seismic sections, Wells, Horizons and 3D bodies easily. The 3D PDF then allows the user and recipient of the file to fully explore the objects and scenes by zooming in and out, or rotating the image to look at every possible angle and view. Paul De Groot, co-founder of dGB Earth Sciences, commented that when they initially announced the functionality, one customer couldn’t quite believe what they were hearing about the possibilities of PDF 3D and asked, “Pardon my technical ignorance on this…are you saying that I can capture a 3D scene from OpendTect, put it into a report and then when viewing the report on screen I can then rotate the scene and treat it like a 3D object (ie. see behind it) Surely not? !” At which point Paul explained this was indeed the case.